Sunderland garage owner George Fraser thought his wife Olive had overdone the mulled wine when she shouted that a reindeer was running down the street. It ran past so fast it was only when George played back his garage CCTV that he saw it for himself. 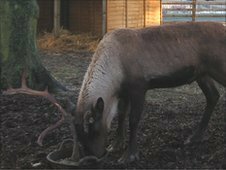 The reindeer was part of a Christmas attraction in Sunderland's Mowbray Park but leapt out of the compound when it was scared by a dog. The council is reminding dog owners to keep their animals on a lead. George Fraser's film shows the reindeer charging down Toward Road in the city. His wife, Olive, saw it first but couldn't really believe her eyes: "We were just standing in the forecourt of the garage and I just caught a glance. "I knew it wasn't a dog because it was so big but when I went out there was no sign of it." George didn't believe his wife until he checked the garage's CCTV camera. The council is reassuring concerned visitors that the reindeer is safe and has been returned to the park.